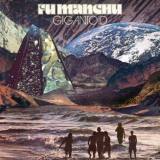 If there's a band content to do their own thing, it's SoCal rockers Fu Manchu. Playing the sort of post-Kyuss groovy stoner rock that so often gets taken for granted but doing it their own way, the band have been around since 1987. Close to the Kyuss template in sound (even boasting a period with Brant Bjork in the band, as well as a drummer called Scott Reeder who is not the more famous Kyuss Scott Reeder) and varying little from album to album, the band have a touch of originality from their punk roots which give their music a gleefully rough edge that makes them sound as much like the Melvins as Monster Magnet. And like you'd expect with a name like that, the band are fun! A new release from Fu Manchu is reason to celebrate, and as summer creeps up on us and playlists turn more cheerful, you could do a lot worse than sticking eleventh full-length Gigantoid in your to-listen pile. Easy to listen to and easier to love, the band indulge their psychedelic side a little more on this album, making songs that both rock hard and meander blissfully – opener Dimension Shifter a perfect example. Gigantoid is at its best when it hits that aforementioned groovy sweet spot, though, and the likes of Anxiety Reducer and Radio Source Sagittarius do their job wonderfully. There's nothing that really tests the listener's patience, either, songs rarely stretching on longer than they need to. The Last Question is the longest track present at just under eight minutes long, and it fills it well, opening with a heavy doom vibe and jamming psychedelically into oblivion towards the end. Most tracks on the album vary from two to four minutes long, with No Warning coming in at just over one – perfectly judged for the sped-up stomper. Mutant's two minute grumble is just long enough, as is the five minutes of the sludgy Evolution Machine. No surprises, no deviations; ultimately this is just very god stoner rock, from a band that does so consistently and deserve to be better known for it.